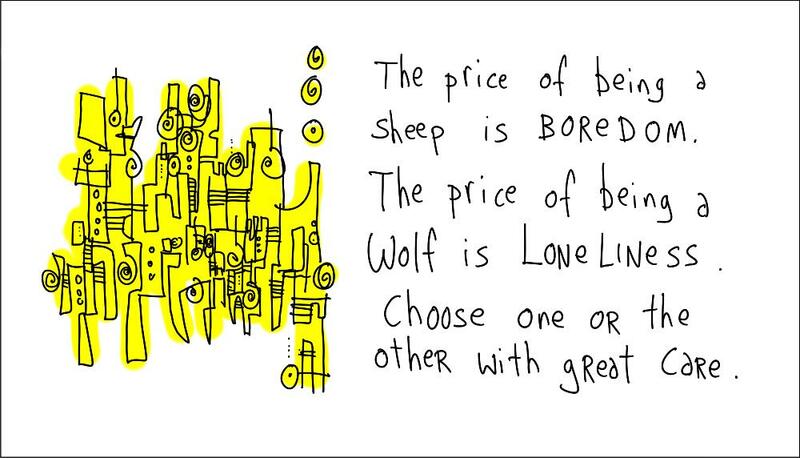 “Wolf vs. Sheep” will be the next gapingvoid print. <ahref=”https://www.gapingvoid.com/content/uploads/assets/Moveable_Type/archives/004906.html”>The_votes_are_in,_and_it_is_always_interesting_to_see_which_image_wins,_and_what_people_have_to_say_about_why._We_were_betting_that_the_winner_was_going_to_be_“Love Begets Love”, but between the emails and comments, it was at least three-to-one for “Wolf vs Sheep”. [Which just proves that I still do not know why people like one cartoon over another]. Even though, fewer people voted for the other images, they were no less passionate about the ones they selected, and that started us thinking… as I will explain below. 1. It’ll be printed around the end of April, and will retail at $450.00. It’ll be an edition of roughly 100, hand signed and numbered by me. The first 30 people who pre-order it by making a $100 deposit using the PayPal button below can have it at the pre-publication price of $265.00. Any orders after, but before the publication date can buy it for $350.00. The minute the print goes into production, the price reverts back to $450.00. 2. To secure your pre-order, please use the PayPal button above to make a $100 deposit. The PayPal form will ask you for all your details [including your preferred shipping address], which of course we’ll have for our records. Why are we asking for a deposit? To weed out the spammers, flakes and trolls out there [This is the Internet, after all], leaving only committed buyers in the mix. No other reason. 3. The print will be ready to ship in 4-6 weeks. We’ll send you another PayPal for the outstanding invoice once the artwork is printed. 4. We’ll be printing these to the same high standards as last time i.e. top-of-the-line inks and paper, approx 24″ x 35″ in dimension. If for some reason, I don’t like the way the colors lay down when I am proofing it, I reserve the right to change the colors and if you don’t like the final image, you can have your deposit back, no questions asked. 5. Shipping & handling [approx $45 USA, $65 abroad] is not included in the price. The buyer is also responsible for any Customs & Excise outside the USA. We ship them flat, not rolled. When you give us your details, please remember to include your name, not just your company name. Otherwise the Post Office won’t accept it. 6. If you have any questions, please feel free to drop me an email at gapingvoidprints@gmail.com, and either Laura or me will answer them. The funny thing about my work is, that because there is so much of it, so many different images mean so many different things to so many different people. On one level, I’ve been really blessed at being very prolific, but on another level, I struggle with deciding what to images to choose for production. Yes, there are obvious ones, like “The Bluetrain”, but many, like “Corinthians”, which proved to be really popular in the end, I could have just as easily not have chosen. There HAS to be a better way. Somehow, I need to make the selection process more open to Everyone…. So I’m thinking to myself, wouldn’t it be cool if people could SPONSOR their own limited edition? Seriously. We’re looking into this idea where individuals can feasibly “sponsor” the production of their favorite cartoon into print form, and harnessing the power of the Internet to get other people to join their cause. We’ll either build or own website for that, or we’ll use something like Fundable.org. 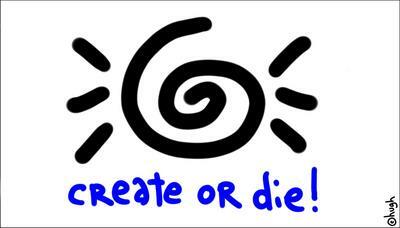 “Love Begets Love” and “Create or Die” will be the guinea pigs. It’ll be really interesting to see what happens. Please watch this space. Thanks, as always, for your love and support! Sounds like @saranyan’s idea with the kids designing business cards for charity. Great plan. Will the person sponsoring/pushing for a specific cartoon get their name on the print, or will it be a group thing where the reward for sponsoring will be getting to buy the print? how will we know if we’re one of the first 30 pre-orders? Really exciting idea; can’t wait to see how it works out. 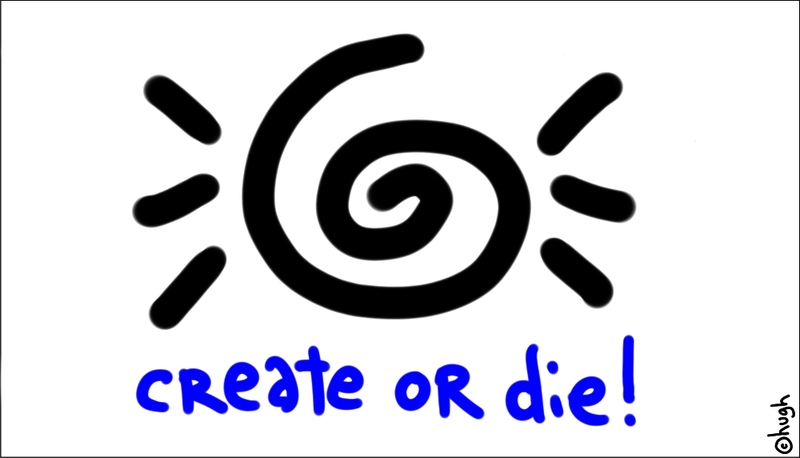 I’ll definitely join the “Create or Die” cause. Glad you’re looking into fundable as I suggested… I think it could simplify both the choosing and billing process for you a lot. The coolest thing is the way it lets people commit to purchase without billing them until critical mass is achieved. Maybe you should try it out with the two that didn’t make the cut on this round and see what happens? Just placed my pre-order. very excited. Love it! Best of luck, keep on making great art! 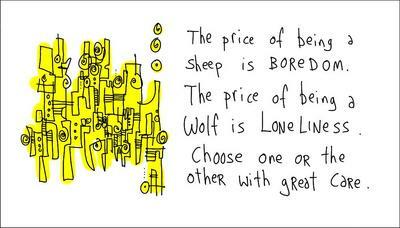 It seems everyone knows that wolf/sheep cartoon is my favourite. I’ve obviously made quite a noise about it in the ether! Someone sent me a twitter message to tell me it was up for sale. I’m devastated that I can’t afford it. You just make sure they all go to good homes, y’hear? @Karyn Romeis: When I bought mine PayPal gave me the option of making payments for it over time. Maybe if you spread it out you could afford it? Oooo! I want help sponsor Love Begets Love – great idea! Can’t wait! Oooo! I want to help sponsor Love Begets Love – great idea! Can’t wait! Pre-ordered one as well. Finally! Can’t wait to hang mine on the wall, tree, post, floor, or whatever floats my boat ! You could use a site like uservoice.com to help manage the voting a little more clearly and for people to talk about their favourite cartoons again. It allows votes to build up over time, people only get their votes back when you complete an idea (or they take their votes back), and it means you only have one place to look at to see where people are thinking. @Lars: I wouldn’t mind getting mine in a different color either, but I guess we’ll have to see what Hugh thinks when he proofs them. Also, when I was in Miami, I saw a yellow version of “We Need To Talk”, and it looked FANTASTIC. Hi Hugh, yes, I can see all those points and I trust you will make the best decision; if you don’t want to overdo a particular shade of red, that’s fine. Just thought you might want to reconsider the bright yellow. I always thought of that message as very “stripped” and “bare”. I definitely look forward to seeing it on my wall.